This is fall on you plate. I make extra and have them for lunch. Yum! 1. Preheat the oven to 400 degrees. Cut the squash in half and scoop out the seeds. Place face down in a baking pan, cover halfway with water, and cover tightly with foil. Bake for 40-50 minutes or until the squash is tender. 1. Meanwhile, prepare the quinoa according to package directions. 2. Place the corn in a dry non-stick skillet over medium-high heat and let the corn pan roast for 3-4 minutes. Stir a few times until the corn is golden brown. 3. Add the cooked quinoa, chili powder, cumin, and salt. Stir for 4-5 minutes over high heat. 4. Add the black beans and stir for another 4-5 minutes over high heat. 5. Remove from heat and stir in ¼ cup cheddar cheese. 1. Turn on the oven broiler (or just turn the temp to 400). Divide the filling evenly among the six cooked squash halves. 2. Top each with a sprinkle of cheddar cheese and bake for 5-10 minutes or until the cheese is melted. 3. 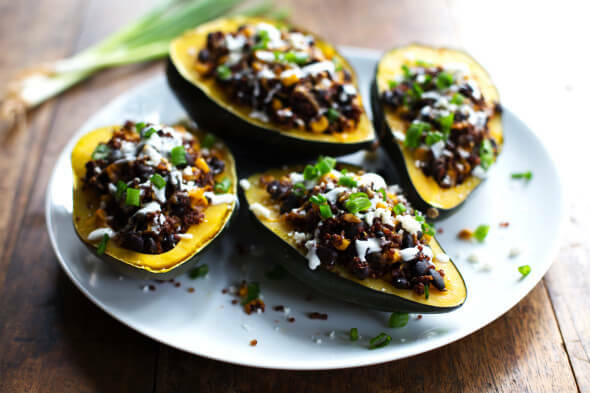 Top each squash piece with crumbled queso fresco, crema Mexicana, and green onions.